Brooks Stevens (1911-1995). Born in Milwaukee, Wisconsin, he studied architecture at Cornell from 1929 to 1933 and immediately entered the profession by designing trademark materials for his father's firm, Cutler-Hammer. He worked on outboard motors for Evinrude starting in 1934, and established his own office that year. He designed the first Wienermobile for Oscar Meyer in 1936 (the last one was in 1988). 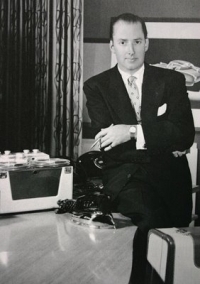 He re-designed the Waverly Steam-o-matic steam iron in 1938 and the Waverly Petipoint iron in 1940. He redesigned the Hiawatha Skytop Lounge for the Chicago, Milwaukee & St. Paul Railroad in 1941. He was one of the founders of SID in 1944. In 1946 he designed the first home freezer, the Ben Hur. He became a consultant to Willys-Overland for post-war Jeep vehicles including the Jeepster in 1948, the Wagoneer in 1963, and the Cherokee in 1974. In 1950, he designed the ubiquitous Formica pattern known as "Skylark" with thin line 'boomerang shapes. He designed for Studebaker from 1962 to 1967, including the 1962-1964 Studebaker Packard GT Hawk and the 1962-1964 Studebaker Packard Lark. In 1963 he designed the Aero Willys 2600, the first car to be produced in Brazil. With AMC head Richard Teague, he designed the 1970 Gremlin, the first truly 'compact' car on the market. Brooks Stevens Design Associates continued under his son Kipp after 1979. From 1983 until his death, Brooks taught at the Milwaukee Institute of Art & Design.